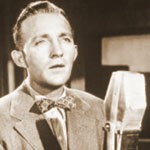 The Bing Crosby Show was a musical variety show broadcast from 1930 to 1956 on CBS & NBC. Bing Crosby was the best-loved star on the American entertainment scene; he was popular and successful in every filed of show business. Crosby was also credited as being the major inspiration for most of the male singers of the era that followed him, including Frank Sinatra, Perry Como, and Dean Martin. Yank magazine recognized Crosby as the person who contributed the most for American G.I. morale during World War II. During his peak years in 1948, many polls declared Crosby the "most admired man alive." Indeed, people appreciated him for his talents and loved him for his humor, ease, and graciousness. Indeed, as the film historian puts it the best, no one had "given so much pleasure to so many people as Bing Crosby." Bing Crosby was so popular that for many years The Bing Crosby Show was on the air nearly everyday. The show involves singing and short comedy skits. Most of the time, it's just Crosby talking with his guests and cracking up jokes one after another.